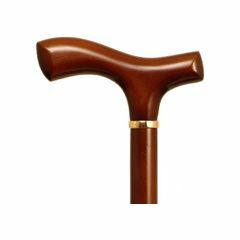 AllegroMedical.com presents the Light Brown Fritz Handle Cane designed by Alex Orthopedic for maximum comfort, support as well as style. Women's canes are 36"L and have a slightly smaller handle to accommodate a smaller hand. Men's canes are 37"L. The Fritz Handle cane solid wood handle and shaft, with 18mm rubber tip has a 250 lb. weight capacity. All canes should be individually fitted to the user. Fritz handle was designed by a German Count to make cane use by the arthritic sufferer more comfortable. The cane was shipped very quickly and arrived in good condition. A quality product at a fair price. Easy To Use. Good. Lightweight. Well Constructed. Safe. Supports Weight. OK. Stores Easily. Indoors. Short Distances. Stairs. Getting up. Lightweight. Supports Weight. Easy To Use. Safe. Stores Easily. Well Constructed. Beautiful. Indoors. Short Distances. Outdoors. Long Distances. Wet Weather. Overall use. You can't beat this cain for the money. I would most definitly recommend it to someone else. by Big Jer from Eugene, Oregon. Indoors. Short Distances. Outdoors. Long Distances. How long is this cane? How much weight does this can support? what is this made of???? Thank you. It's made of a nice fine grained hardwood. Maple or perhaps Beech.